A salsa shoe is not like any other. It is made for dancing. There are even different shoes for different dances. The perfect dance shoe fits the foot, is comfortable and looks great. Because you want to dance on it all day and night long. Latin dance shoes for men have two types of heel, the standard heel or Cuban heel. The Cuban heel is somewhat higher. Most men’s salsa shoes are black patent of black leather. But we do see some variety like black and white patent, brown leather of brown and white leather. E.K.Clothing has a great selection of dance shoes for men. For practicing purposes the sneakers are popular. The sole of the shoe consists of two parts. The front and back part of the shoe. The space in between gives extra flexibility to the shoe and gives the support you need for dancing. 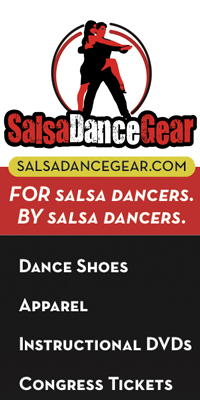 Even though the sneaker is often used, most salsa dancers use jazz shoes for practicing. They are very small and almost feel like you are wearing socks in stead of shoes. You can choose between full suede sole, split suede sole or a rubber sole. They are available in the colors black and white. Men often wear the jazz shoes on salsa parties and congresses. They are comfortable and are easy to take with you as they are so small. Dance shoes for women of course come in many different varieties. All colors you can think of and from flat shoes to very high heels. For a woman the show is like an accessory. Most women would love a different salsa shoe for every outfit. Open toe Latin shoes are more popular then the closed toe shoes. The height of salsa dance shoes for woman start at 1.3 inch, but these are considered more for practice. Usually the height is between 2 and 3 inches. Satin and black are the most popular colors. Also red silver and gold are hot. But if you really want to stand out you choose something unique. Exotic salsa shoes has hundreds of affordable salsa shoes, for men and women. From 'Salsa Shoe' to 'Salsa Clothes'.